You get married, buy a house, have a kid and maybe another and life gets busy. The last thing you think about is what happens to your house, your kids and other assets when you die. But it is important to think about these things. And, it’s even more important to create a living trust when you have a family and significant assets. With a living trust, you have control over who gets your property and guardianship of your kids should something happen to you and your spouse. In the absence of a living trust or a will, those decisions get made by the court, and may not always be what you had in mind. A living trust is a written legal document that explicitly states who should receive your assets and have guardianship of your children when you die. When you create a living trust, all of your assets are transferred to your trust and are used as you wish during your lifetime. Once you die, your assets are transferred to the named beneficiaries, which can be persons or charitable organizations. There are two types of living trusts: revocable living trusts and irrevocable living trusts. A revocable living trust can be amended at any point during your lifetime. That means you can add new assets, remove assets and change beneficiaries or guardians. If you don’t want to go through the time and expense of making changes to your living trust anytime a big event happens, you can make broad provisions that will include future big events. For example, you can leave your home to all current and future children. An irrevocable living trust cannot be amended. Once you transfer your assets to the trust, they are considered property of the trust. For people with a lot of assets, this can be a useful way to avoid some taxes and provide protection from creditors. Irrevocable living trusts are not as flexible as revocable living trusts and may require a lot more paperwork and costs to set up. The assets in your living trust are managed by a trustee, which is generally yourself. That way you can still manage assets like financial accounts and your residence during your lifetime. When setting up a living trust with your spouse, you usually become co-trustees of the living trust. You can also choose to have a successor trustee who manages your assets if you become unable or unwilling to do so. This person will distribute the assets in your living trust when you die. This person is often your surviving spouse or adult child, but you can name anyone as a successor trustee, including a bank or a trust company. Each state has its own rules for setting up a living trust. When setting up a living trust, it’s important to comply with the laws of the state you’re in. If you later move to another state, your living trust will be valid, but it's a good idea to check with a lawyer in the new state to ensure no revisions need to be made to comply with the new state’s laws. For example, if you move from a state with laws related to community property to a common-law state where property acquired during marriage is not automatically divided, you may need to revise your trust document. There are many benefits to having a living trust. The most obvious benefit is that it gives you a say and some control over what happens when you die. This can bring peace of mind during your lifetime, especially when kids are involved. Another benefit is that a living trust avoids costly and lengthy court probate proceedings that can significantly reduce the actual value of the assets you want to pass on. Since it avoids probate and the public court process, a living trust remains private instead of becoming a matter of public record. A living trust can also help reduce your estate’s tax burden. In addition to a will, a living trust is an important part of the estate planning process. It should be created along with, and not instead of, a will. Whether or not you ultimately opt to create a living trust often depends on the size of your family and how many assets you have. Once your living trust is created, keep it somewhere safe, such as in a safe-deposit box. Also let someone know where you keep it so that it can be readily found if you suddenly pass away. You don’t want to go through the process of creating a living trust only to have it be forgotten or ignored. When you die, the assets in your living trust automatically pass to the named beneficiaries. If a living trust is set up correctly, there is no question of how to distribute trust assets to beneficiaries. You can even make provisions in your trust for relatives who are not born yet, for example, you can make gifts to future grandchildren. You can put parameters on the use of the gifts, such as allowing those grandchildren to receive money from the trust only to pay for their higher education. Personal property, such as jewelry, clothing, electronics and books. Household items, including antiques and art. Bank accounts, including checking and CDs. Investment accounts, excluding retirement plans. One of the main perks of a living trust is that, unlike a will, it does not go through the probate process. When you have a will, it goes through a court-supervised probate process before your assets are distributed. This often comes at great expense and inconvenience to named beneficiaries. With a living trust, however, assets can immediately be distributed to named beneficiaries. Because of this, it’s important to think about to whom you want to leave your assets when you die. If you know a particular piece of jewelry has meaning to your sister, specifically state that in your living trust. If you want your share of your residence to be split equally among your three children, make sure that’s clear in the document. How to distribute trust assets to beneficiaries is completely up to you. It’s a personal decision that nobody can make for you. When it comes to issues like who is going to take guardianship of your children or your pets, make sure you select a trustworthy person to take care of the things most precious to you while carrying out your wishes. It’s important to discuss how to distribute trust assets to beneficiaries and any guardianship issues with your spouse since you will create a living trust together and most of the assets you’ll distribute may be community property. If one of the beneficiaries named in your living trust dies before you do, the property automatically goes back to your estate when you die unless you’ve named a contingent beneficiary for that property. What Happens to a Revocable Trust When the Grantor Dies? When you create a living trust, you are known as the grantor or trustor. You are essentially granting your assets to the trustee for the benefit of the named beneficiaries. Since you can revoke your living trust at any time, it is known as a revocable living trust. It may also be known as a grantor trust or a revocable inter vivos trust. So what happens to a revocable trust when the grantor dies? When the grantor dies, the trust is no longer revocable and it can no longer be changed. When you die, your named assets become property of the trust, and the trustee must manage them as indicated. If you were the trustee as well as the grantor, then the successor trustee or co-trustee takes over the trust. That person cannot make any changes to your trust, but must distribute the assets per your wishes and explicit directions. The trustee has a very important job, so you should name someone you trust completely to manage your financial affairs. The trustee must manage all estate assets, including real estate and financial accounts. This may require getting items appraised and providing needed documentation for accounts. Upon the grantor’s death, the trustee must also file tax returns and pay any outstanding debts and bills, especially if they impact the estate, such as property tax on any named property. Once all of the debts, taxes and expenses are paid from the estate, the trustee must distribute all specific gifts to the named beneficiaries. Specific gifts of cash and property must be given to the appropriate people before the remainder of the property is distributed. Some states require court approval before distributions are made. If there are restrictions on the gift, such as only giving a child a certain amount of money each year until he turns 25, the trustee must comply with those provisions until the conditions are fulfilled. How much you spend to create a living trust depends on where you live, how complicated your trust is and if you have other documents created at the same time. You will generally pay an attorney a flat fee to create a living trust for you. The flat fee usually includes the cost of creating accompanying documents, such as a will and a power of attorney. Otherwise, an attorney may charge an hourly fee. If you’re wondering how much a living trust can cost, consult with attorneys in your area to find one that works in your price range. The price of setting up a living trust can be around a couple of thousand dollars, depending on all the factors. While you can create a living trust on your own, it’s worth spending money to work with an estate planning attorney to make sure everything is set up correctly and that nothing is overlooked. You also want to make sure that all of your assets are properly included in your trust. For instance, the deed to your house must be reassigned to your trust, and any future real estate must be deeded to the trust when acquired. Find an attorney who has experience in estate planning and setting up living trusts. Ask for recommendations from people you know or search online. Just be wary of anyone offering low-cost services or who does not fully explain the process of setting up a living trust. If you ask a qualified attorney how much it will cost to create a living trust, she should be able to give you a approximate breakdown of the fees and costs. 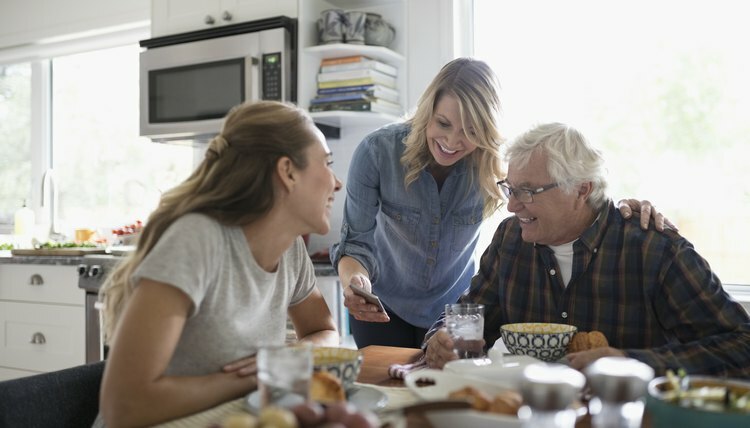 While making provisions for what happens to your property and even the care of your children after you die isn’t always easy to think about, it’s an important step to take. With the creation of a living trust, you’ll have peace of mind knowing that you made decisions about the things most important to you, and that these decisions will be honored even when you are no longer there to make them. Bloom, Leslie. "How to Distribute the Assets of a Living Trust After Death." , https://legalbeagle.com/5831548-distribute-living-trust-after-death.html. 23 October 2018.